Article I Section 27 of the Pennsylvania constitution states: The people have a right to clean air, pure water, and to the preservation of the natural, scenic, historic and esthetic values of the environment. Pennsylvania's public natural resources are the common property of all the people, including generations yet to come. As trustee of these resources, the Commonwealth shall conserve and maintain them for the benefit of all the people. Citizens often read this strong language as creating a separate, constitutional right that can be violated by activities that adversely impact air, water, natural, scenic, and historic resources in Pennsylvania. As a result, citizens may want to assert a claim under Art. I, § 27 as one ground for challenging permits or other decisions by state agencies. However, Pennsylvania courts are extremely reluctant to recognize such claims. The East Goshen Safety and Environmental Advocates (EGSEA) formed in June 2017. The initial group of concerned residents were awakened by the reality of the Mariner 2 Project impacting the overall safety and environment of our township. To ensure the safety of East Goshen residents, family pets and wildlife, and to protect our environment from the dangers inherent in the transmission of commercial fuels through pipelines in residential, high density population centers within our township. We are also part of a much larger coalition up and down the pipeline that says "NO MORE PIPELINES THROUGH HIGHLY POPULATED AREAS. PERIOD." HOW DID WE GET HERE AND HOW DO WE STAND UP? 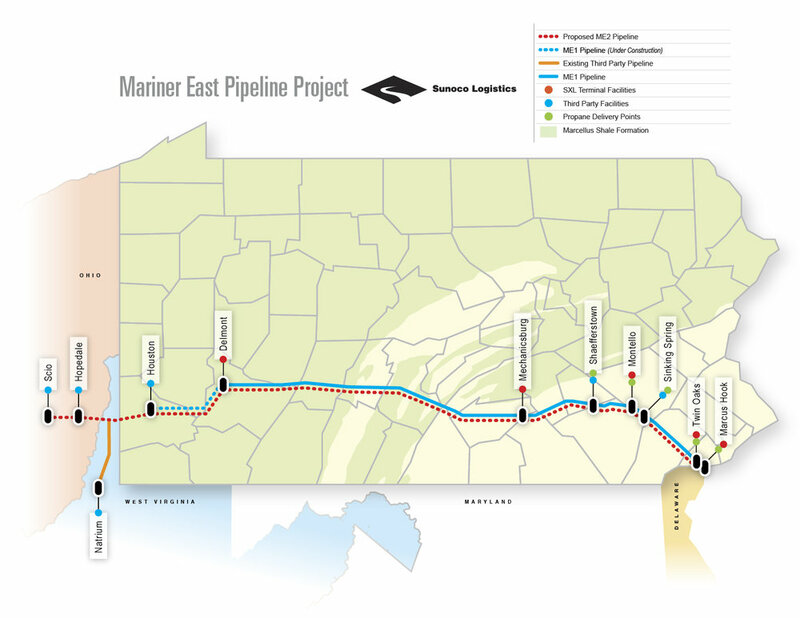 The Mariner East projects were designed to provide pipeline infrastructure to transport ethane, propane and butane (natural gas liquids) from the Marcellus Shale to markets overseas and secondarily in Pennsylvania. The industry suggestion is that these pipelines will create more jobs, improve our economy and position the commonwealth to be a national and global economic leader. It is estimated that these projects will generate $4.2 billion in economic impact and support more than 30,000 new Pennsylvania jobs. Nowhere is there mention of any safety or environmental concerns particularly in high densely populated community such as East Goshen. We're standing up by working collaboratively with the East Goshen Board of Supervisors, and other PA elected officials, and, most importantly, mobilizing East Goshen residents around our shared concerns. We have begun mobilizing the residents of East Goshen to ensure that elected officials understand our concerns, as well as our intent to support those in office who understand the importance of our votes individually and collectively. We also commit to support and engage with fellow safety and environmental advocates up and down the pipeline to ensure the best interests of not only East Goshen but other PA residents impacted by the pipeline are heard loudly and clearly. In collaboration with other safety minded groups, we are helping to harness the collective effort, passion, and the will of the people. Click here to join us.